As the primary bankruptcy attorney here at Johnson & Bryan, I really get to see and feel the impact consumer debt has on our customers. Usually when we first speak, my clients are nervous or hesitant that we can actually help. They've usually been beat down by creditors and their lawyers demanding money they don't have, and just the thought of dealing with yet another attorney is pretty frightening. Most people come in with so many false assumptions about bankruptcy here in Texas. They're generally afraid they are going to lose everything, and that their life will be ruined for the next 7-10 years. The things you hear about bankruptcy are just plain false. Bankruptcy in Texas is a proven and legally protected right to help you get back on your feet, and the process is generally quick and easy when you have an experienced bankruptcy attorney at your side. Even if you aren't sure yet if bankruptcy is the right option for you, please don't hesitate to give me a call to discuss your case. I've literally handled thousands of these cases, and I can usually very quickly let you know if bankruptcy is your best option, or if there is a different solution for your particular case. I enjoy helping people get out of debt, and would be glad to help you as well. While attending law school, Travis clerked for The Johnson Law Firm (then, Chad Johnson and his father, John). Upon graduating law school, he accepted a position with a high-volume debt collection law firm in Houston, TX. Unsatisfied with the nature of his practice, Travis decided to take matters into his own hands by focusing his efforts on helping people get out of debt. 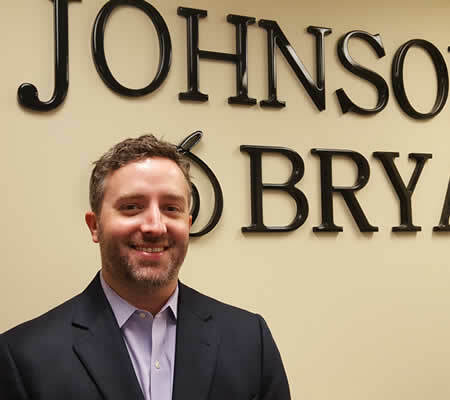 He started Johnson & Bryan with his former boss, Chad Johnson, and devotes the majority of his time to consumer bankruptcy and debt-related litigation. Should you find yourself in the position to file for bankruptcy, Travis has filed hundreds of Chapter 7 cases for the firm. Travis has also litigated more than 100 bench trials throughout the state of Texas. When he isn’t helping his clients, Travis loves to spend time with his wife and two children, Jonah and Quinn. When they can, Travis and his family give back to Texas Children’s Hospital where their children have spent considerable amounts of time as premature babies. Travis’ hobbies include rooting for all Longhorn and Houston sports teams, and playing golf. Do you need help filing bankruptcy? Travis is available to discuss your case and provide options for dealing with your debt related issues. There is no charge and no obligation to receive great legal advice. Let's talk today and work on getting you a fresh start!